This course is the second module in the Aquatic Options series. 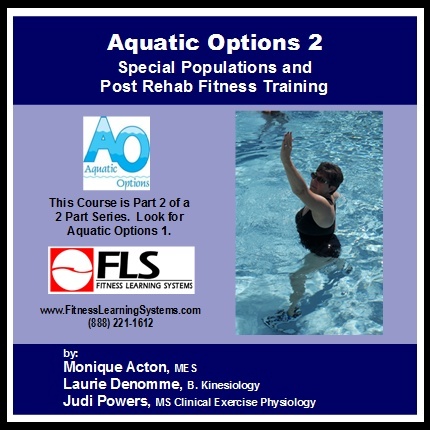 The information presented in this course is the resource material used in the Aquatic Options: Special Population & Post Rehab Fitness Training Certificate course. Aquatic Options was specifically designed for aquatic fitness professionals, Personal Trainers, Physical Therapy Assistants, Occupational Therapy Assistants, Recreational Therapists, and any other professional working with special populations and post rehab individuals in the aquatic environment. In this course you will learn simple modifications for participants with specific medical conditions including arthritis, diabetes, hypertension, and obesity. In addition, you will gain the confidence to choose appropriate equipment for all of the populations discussed in both courses. It also provides an introduction to the assessment, evaluation, documentation and reporting process. Put together all that you have learned in both courses using the sample programs provided and be able to design your own safe and effective aquatic fitness programming for special populations. Understand concepts for how to get started working with special populations in the aquatic environment including standard of care and risk management. Be introduced to personal fitness screening and learn how to select appropriate pre and post assessment tools. Describe exercise training principles specific to exercise in the water. Review resistance training exercises for many musculoskeletal conditions. Understand the program components for a safe and effective aquatic work out including warm up, endurance and conditioning, and cool down and stretch. Learn how to select appropriate aquatic exercise equipment and use the equipment effectively. Understand effective aquatic equipment progressions.